With a look that could cut steel, Bhola Bikram Thapa is a self-made man; he made it in Durbar Marg and he’s not planning to quit anytime soon. 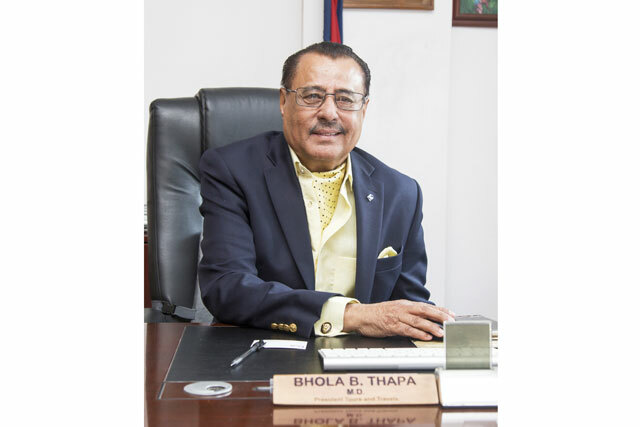 If Durbar Marg were to recognize a person as an exemplary figure, one of the names on that list would be Bhola Bikram Thapa, President of President Travels. Before becoming the suave and sophisticated man that he is now, he was just a regular Nepali man trying to make ends meet and provide a better life for his family. He has spent almost forty years working and running a business at Durbar Marg and has watched the area gradually transformed into the swankiest part of Kathmandu. I visit his office at President Travels from where he has a bird’s eye view of the street below that is teeming with life, and attempt to revive memories of the old street from one of the stalwarts of the travel trade in Durbar Marg. Q: A short introduction about yourself? A: I’m the President of President Travel Group of Companies. I’ve been working here in Durbar Marg for nearly forty years and I don’t plan to stop anytime soon. Q: What was Durbar Marg like before it turned into this bustling street? A: It was nothing like what you see before your eyes. The area was pretty bleak in terms of shops and things to do as Durbar Marg was closed off as private property. There was a lone restaurant nearby and not much else. Gradually, it was opened up and the first wave of businesses came. Riding on the crest of the wave was Yeti Travels, one of the first travels agencies in Nepal, and my first job was with them. Q: What’s your fondest memory of Durbar Marg? A: I remember the year when India and China were in a tense standoff with the threat of military conflict between these two big nations and Nepal was caught in the middle. Tourism dried up in Nepal and I was worried about my job at a travel agency. To pass the idle days, I would sit outside on Durbar Marg road peeling and eating roasted peanuts, and hatching plans with my colleagues in case war broke out between the two neighbors. Q: Why is Durbar Marg an ideal place to set up shop for the new and established businesses? A: Durbar Marg is an interesting place where large chunks of the original buildings that would later become retail spaces belong to single owners. So even if a new business wanted to set up in Durbar Marg, they would have to fit into the existing space rather than make wholesale changes to the look of the place. Take New Road for instance, there are too many businesses that have sprung up and there is no cohesion, plus the overcrowding, while Durbar Marg has a nice flow to it. It also helps that the high rent here weeds out a majority of businesses and only attracts the high-end companies which in turn attracts people with money to spend. Q: If you had guests visiting Durbar Marg, where would you take them? A: Back then I would have taken them to Nanglo as that was one of the best restaurants in Durbar Marg but it has sadly moved to Kamaladi. Nowadays, there are a lot more options and things to do in Durbar Marg compared to the past where there was nary a shop in sight. You can go to the Coffee Shop at Hotel Annapurna or even hit the latest club, Déjà vu.